What is the difference between a maze and a labyrinth. Although the two terms are basically synonymous, there is a difference. In this case a maze refers to a complex branching multicursal puzzle with choices of path and direction, while a unicursal labyrinth has only a single path to the center. A labyrinth in this sense has an unambiguous route to the center and back and is not difficult to navigate. 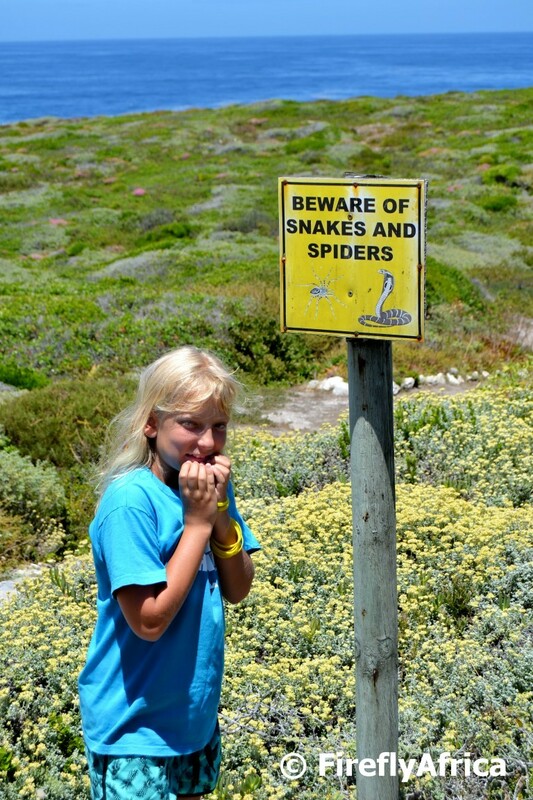 The difference between the two meant the KidZ learned something during our summer holiday in the Overberg region of the Western Cape. We drove to the town of Napier and I told them that we were going to make a stop to do a cache at a labyrinth. 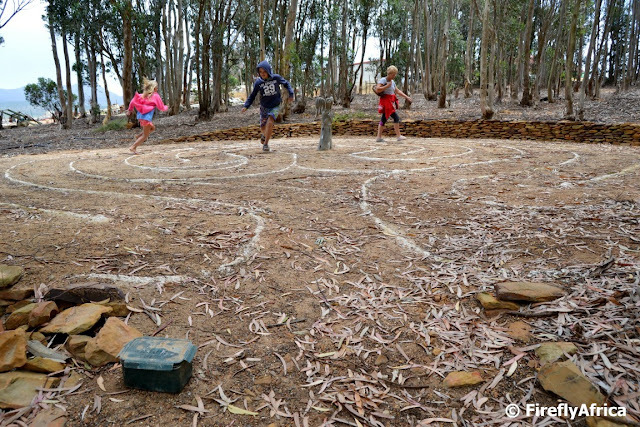 They wanted to know what a labyrinth was and I told them it was like a maze. That was where I made the mistake. They had done the big maze at the Plett Puzzle Park before and in their minds there was going to be something similar. When we got to The Red Windmill outside Napier and dashed off to go and find the maze only to be met by a "wall-less" labyrinth. Oh the disappointment. The ran off to the middle though following the path round and round, kinda defeating the purpose of this labyrinth being one of meditation and contemplation. They had fun regardless. While they were following the route to the middle I retrieved the cache from its hiding place and signed the log, adding another smiley to my Geocaching map. The Danger Point and the Danger Point Lighthouse near Gansbaai in the Overberg has a descriptive name very apt to how dangerous the coast here can really be. It doesn't looks as dangerous though when you photograph it with little pink wildflowers in the foreground. After climbing the Danger Point Lighthouse outside Gansbaai in the Overberg in December, Drama Princess and I headed down the path towards the rocks to find a Geocache hidden nearby. As we hit the trail down we encountered this sign. Damn, those must be big spiders if there is a warning sign including them along with snakes. 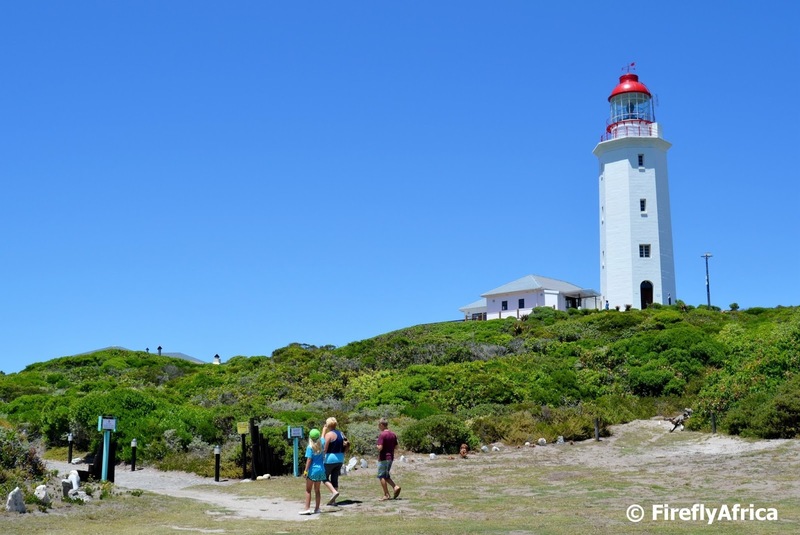 South Africa has some famous lighthouses. Cape Point, Green Point, Agulhas, Great Fish and Umhlanga just to name a few. 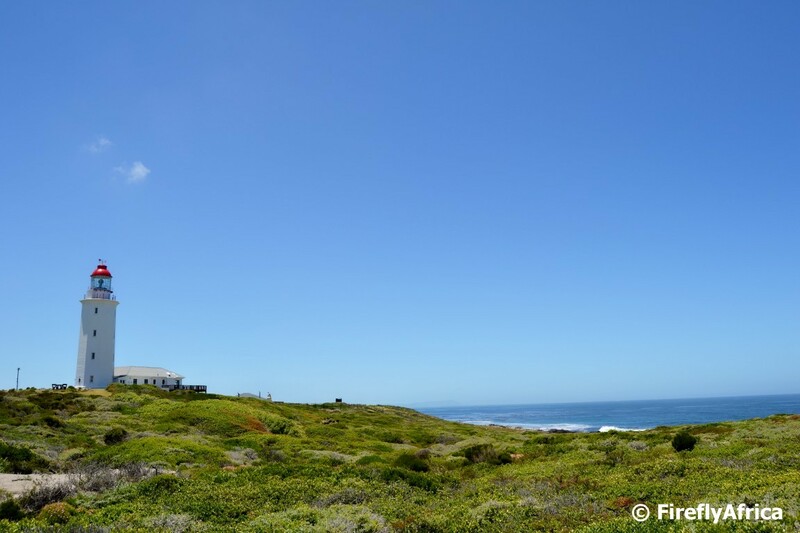 There are close to 50 lighthouse along the South African coast though and some often receive very little publicity because they are very much off the beaten track or just don't get visited as often as the well known ones. 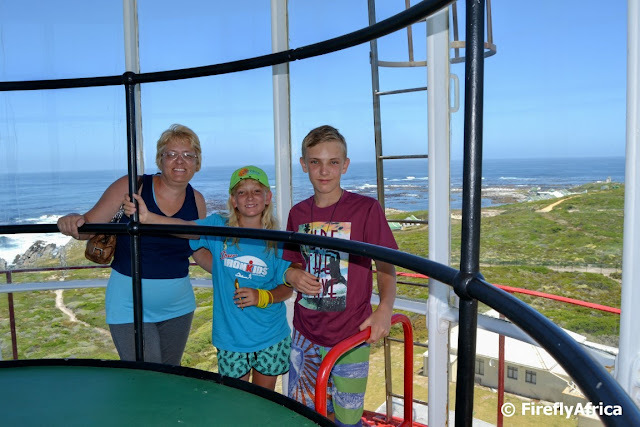 During our camping holiday at Vloedbos in the Overberg we spent one day exploring the coast between Gansbaai and Agulhas and I got to visit the Danger Point Lighthouse just outside Gansbaai for the first time. 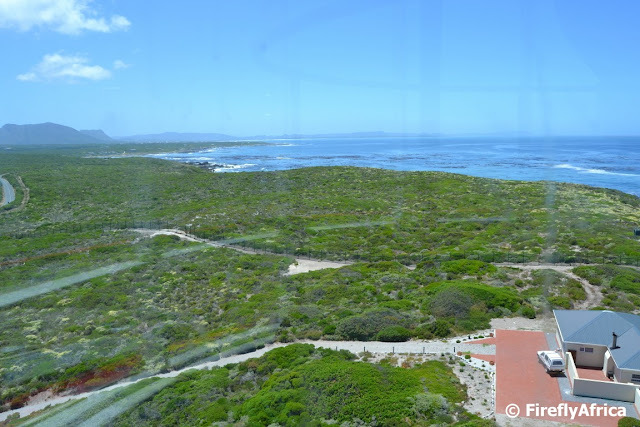 Bartolomeus Dias landed at what is now known as Danger Point on 16 May 1488. He originally named it Ponte de Sao Brandao. 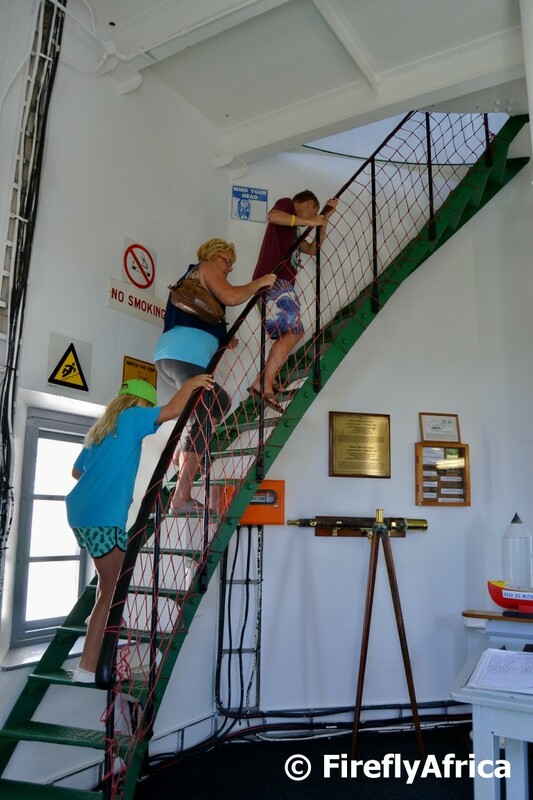 The name Danger Point comes from the dangerous reefs and rocks below the water which make it very dangerous for ships to sail close to the coast. The most famous ship to be wrecked off Danger Point was the troopship HMS Birkenhead. It was wrecked about 1,6 km from Danger Point in 1852, three years before the lighthouse was built, on a barely visible rock now named Birkenhead Rock. The ship carried young Welsh and Scottish soldiers as well as their officers and families, on their way to Eastern Cape to fight the Xhosa. The Birkenhead became famous as it became the first wreck where the captain called "women and children first". All women and children were saved but most of the men perished. The light was first activated on 1 January 1895. The first light produced a beam of 45 000 candle. Today's modern light has a strength of 1 700 000 candle at its peak flash intensity. The lights is 45 meters above high water and can be seen from 25 sea miles out. You can see for miles from the top and it's clear why it is easy for a ship sailing close in shore to get into trouble here. We fortunately didn't run into any trouble and avoided any collision with the rocks. Unfortunately there weren't anybody else at the top of the lighthouse to take a family photo so here is one minus yours truly. Once again just a little exploring took us to yet another new place. It makes it hard to understand why some people never want to go anywhere and just sit in front of the tv or go walk around shopping centres. I always think that the guys along the coast in the Western Cape are very fortunate because of the amount of fresh fish available to them from all the fishing harbours. Whenever we get to travel in the province we like to go and have fish and chips from a local takeaway, usually overlooking the harbour and surrounds. 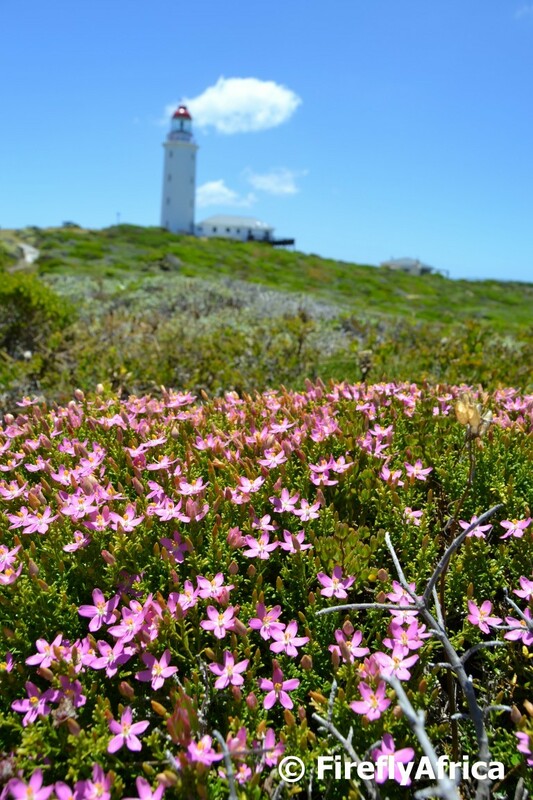 During December we were camping in the Overberg and did a daytrip from Gansbaai to Agulhas. 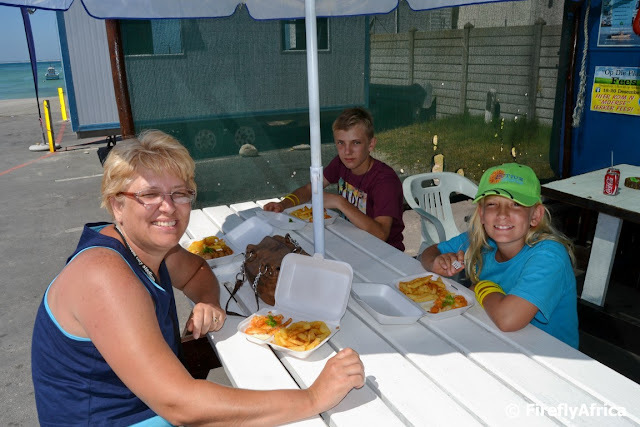 Somewhere in between the Damselfly mentioned that she hoped we would be able to have fish and chips along the way and by the time we entered Struisbaai it was past lunch time already and the stomachs were grumbling louder than the KidZ on the back seat. 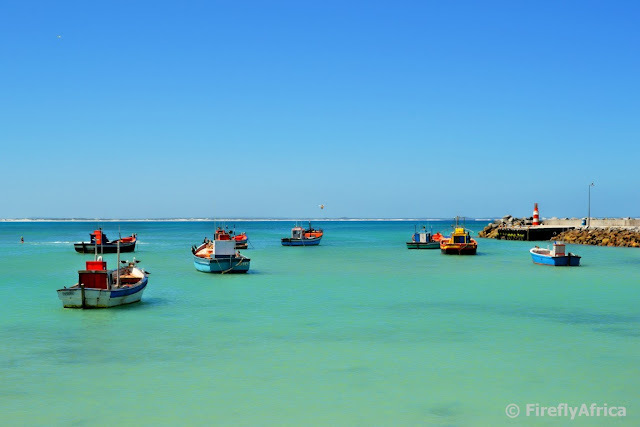 We went straight to the scenic Struisbaai Harbour which, along with the adjacent beach, was packs with holiday makers. We headed towards the biggest gathering of people around what looked like the restaurant area on the harbour but disappointingly turned around at the door when we noticed a regular restaurant menu and prices. We wanted proper takeaways. As we strolled around the corner we saw what we were looking for. A caravan doing takeaways plus a sign saying everything is done fresh and from scratch so the food may take a little time. Now that is a language we understand. Snoek, hake and calamari enjoyed with proper slap chips from takeaway containers. All that was missing was the food being wrapped in newspaper, but what the heck, we found what we were looking for. 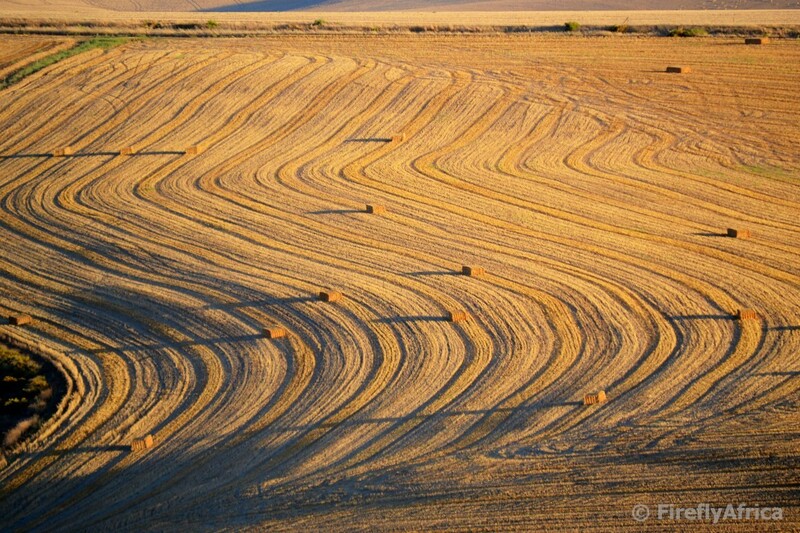 The brown stubble covered fields in the Overberg during summer isn't always perceived as the most beautiful scenery by travelers. That is until you look a little closer, especially just before sunset. 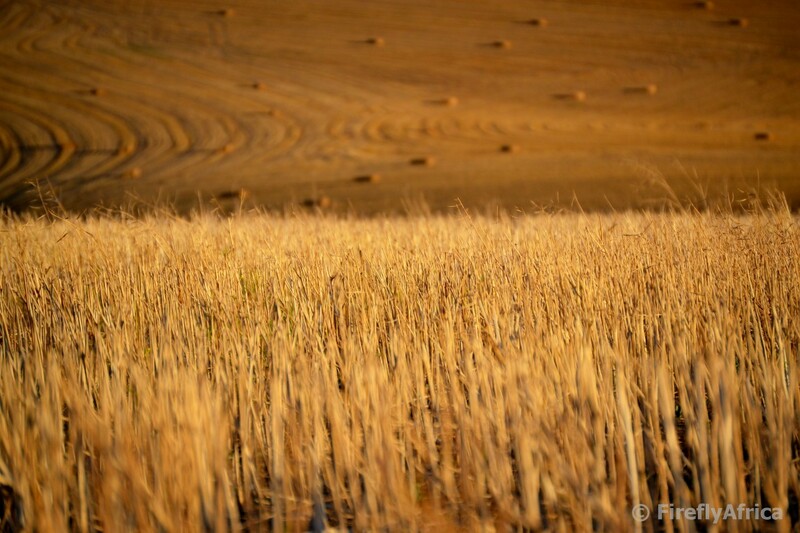 Driving through the Overberg region of the Western Cape in late winter and spring you are met with rolling hills covered in green and yellow. By the time summer comes around the grains like wheat, oats and barley as well as the canola have been harvested leaving nothing more than field after field of brown stubble and scattered hay bales. 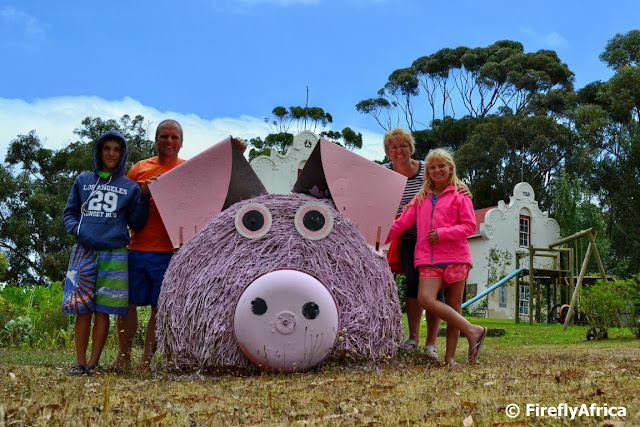 We spent 10 days over the December holidays camping at Vloedbos Holiday Resort in the Overberg and I have a couple of days left before heading back to work on Monday. So between chilling in the pool, keeping the KidZ busy and doing a few chores around the house, plus sleeping a little late for a change, I haven't really done much blogging lately other than my daily posts on PE Daily Photo. But I think it's time to start sharing with all of you again. A few days before Christmas the KidZ noticed that the moon was starting to fill out and I decided to check when it was going to be full moon. 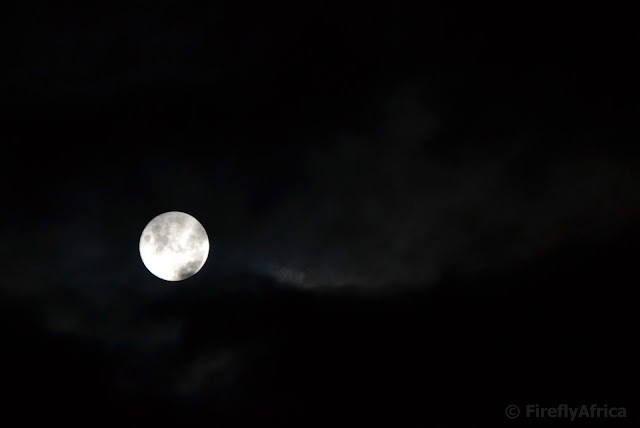 Turned out that it was full moon on Christmas Day. Interestingly the last time full moon fell on Christmas Day was back in 1977 and it won't happen again until 2034.